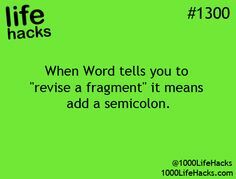 Life Hack: Word grammar check finally explained | Study. Read. Write. Don’t you just hate that wiggly, green line in Word? The sentence makes sense, but Word is still complaining. No more! Life Hack!